As the Fatima Message has become increasingly burdensome to those prelates wishing to make ecumenical overtures, the Message of Fatima needed to be dispensed with completely. No longer content with simply undermining the Message of Fatima, these prelates are now determined to bury the Message of Fatima once and for all. They would like it to be reduced to a call for the practice of personal piety, to the exclusion of any relevance to the life of the world or of the Church. They endeavor to render any prophetic elements in Fatima’s message irrelevant. In other words, they want to bury it, so that everyone will forget its “ecumenically embarrassing” aspects. There are many examples of the attempts being made to bury Fatima in recent years. This article, however, will focus on some of the more striking of these. As early as June of 1999, Pope John Paul II made known his intention to beatify Jacinta and Francisco Marto, in a ceremony at Fatima on May 13, 2000. This development had clearly triggered an internal struggle within the Vatican apparatus. This is shown by the curious vacillating of the beatification ceremony details, which is most unusual for the Vatican. First, the Secretary of State, Cardinal Angelo Sodano, announced in October 1999 that the beatification of Jacinta and Francisco would take place on April 9, 2000 in St. Peter’s Square, along with four other beatifications. The Patriarch of Lisbon is quoted in the Portuguese press as having been informed by the Vatican that it was “quite impossible” for the Pope to come to Fatima for the childrens beatification and that the question was “closed”. The Patriarch told Portuguese journalists that he was convinced this “impossibility” of the Pope coming to Fatima was exclusively due to a decision by none other than the Vatican Secretary of State. Pope John Paul II, however, had other ideas. In November 1999 His Holiness — obviously bypassing Cardinal Sodano — directed the Bishop of Leiria-Fatima, Serafim de Sousa Ferreira e Silva, to announce that the Pope would indeed come to Fatima on May 13 to perform the beatifications. Bishop Serafim made this announcement in December 1999. And then, in March of 2000, the Bishop also let it slip that “the Pope will do something special for Fatima”. This prompted furious speculation in the press that the Pope was, at last, going to reveal the Third Secret. Bishop Serafim was subsequently rebuked in public by the Cardinal Patriarch of Lisbon, José da Cruz Policarpo. On the solemn occasion of his visit to Fatima, His Holiness has directed me to make an announcement to you. As you know, the purpose of his visit to Fatima has been to beatify the two “little shepherds”. Nevertheless he also wishes his pilgrimage to be a renewed gesture of gratitude to Our Lady for Her protection during these years of his papacy. This protection seems also to be linked to the so-called “third part” of the secret of Fatima. That text contains a prophetic vision similar to those found in Sacred Scripture, which do not describe with photographic clarity the details of future events, but rather synthesize and condense against a unified background of events spread out over time in a succession and a duration which are not specified. As a result, the text must be interpreted in a symbolic key. According to the interpretation of the “little shepherds”, which was also recently confirmed by Sister Lucia, the “Bishop clothed in white” who prays for all the faithful is the Pope. As he makes his way with great effort towards the Cross amid the corpses of those who were martyred (bishops, priests, men and women religious and many lay persons), he too falls to the ground, apparently dead, under a burst of gunfire. After the assassination attempt of 13 May 1981, it appeared evident to His Holiness that it was “a motherly hand which guided the bullet’s path”, enabling the “dying Pope” to halt “at the threshold of death”. The successive events of 1989 led, both in the Soviet Union and in a number of countries of Eastern Europe, to the fall of the Communist regime which promoted atheism. Even if the events to which the third part of the Secret of Fatima refers now seem part of the past, Our Lady’s call to conversion and penance, issued at the beginning of the Twentieth Century, remains timely and urgent today. In order that the faithful may better receive the message of Our Lady of Fatima, the Pope has charged the Congregation for the Doctrine of the Faith with making public the third part of the secret, after the preparation of an appropriate commentary. Cardinal Sodanos statement that the Third Secret of Fatima “now seems part of the past”, except for the “call to conversion and penance”, makes no sense. It is not credible to say that the Third Secret refers to the shooting of the Pope in 1981 and is outdated since the so-called “fall of communism” in 1989. The revelation of the vision and Cardinal Sodano’s interpretation make no sense if that was all there was to the Third Secret. If it was, why wasn’t it revealed in 1989, when it allegedly became outdated? This question has no reasonable answer. However, it would be quite reasonable if Cardinal Sodanos point was to make sure that the question of Fatima would be laid to rest, or in his words, made “part of the past”. At a June 26, 2000 press conference, the Vatican released a text it claims to be the entire Third Secret of Fatima, accompanied by a commentary co-authored by Cardinal Ratzinger and Archbishop (now Cardinal) Bertone. The text describes a vision in which the Pope (a “Bishop dressed in White”) is killed by a band of soldiers who shoot him down while he is kneeling at the foot of a large wooden cross atop a hill, after having traversed a half-ruined city filled with corpses. The execution of the Pope is followed by the execution of many bishops, priests and laity. Naturally, upon the release of this vision questions abounded. Among these questions was why the published vision contained no words of Our Lady, even though, when it announced in 1960 that the Secret would not be released (“it is most likely that the letter will never be opened”), the Vatican itself referred to “the words which Our Lady confided to the children as a secret.” The vision also fails to mention the words that clearly follow “In Portugal the dogma of the Faith will always be preserved etc.” — the phrase spoken by Our Lady, which Sister Lucy included in her fourth memoir as part of the integral text of the Third Secret of Fatima. This phrase concerning the dogma of the Faith in Portugal was mysteriously demoted to a footnote in the Vatican commentary on the Secret, where it was ignored by both Cardinal Ratzinger and Msgr. Bertone, the co-authors of the commentary. Cardinal Ratzinger’s portion of the commentary specifically stated that he and Msgr. Bertone were following the “interpretations” given by the Cardinal Secretary of State, Angelo Sodano: i.e., that the Message of Fatima, and the Third Secret in particular, relate entirely to events that now belong to the past. Accordingly, Cardinal Ratzinger claimed that Pope John Paul IIs escape from death in 1981 is what is depicted in the vision of the Pope being killed. Even the secular media recognized the falsity of this interpretation. The published text of the vision contains none of the elements described by Cardinal Ratzinger in his 1984 interview in Jesus magazine (see “Published Testimony: Cardinal Ratzinger”). The published vision of June 26, 2000 says nothing about the “dangers threatening the Faith and the life of the Christian and therefore [the life of] the world”, nothing about what is contained “in many other Marian apparitions” approved by the Church, and nothing about prophecies “announced in Scripture”, all of which Cardinal Ratzinger affirmed was in the Third Secret in his 1984 interview. Further, while Cardinal Ratzinger said in 1984 that the Third Secret contains “religious prophecy” — a statement he made three years after the attempt on the Pope’s life — he claimed in the June 2000 commentary that there is no prophecy, but only a description of past events, culminating in the 1981 assassination attempt. In his commentary Cardinal Ratzinger scandalized the faithful by making a number of ridiculous — if not blasphemous — claims, such as that the Triumph of the Immaculate Heart of Mary is nothing more than love conquering bombs and guns, that the Triumph that Our Lady promised would take place “in the end” actually occurred 2,000 years ago with Her fiat at the Annunciation, when She said to the Angel Gabriel, “Be it done unto Me according to thy word.” He also claimed that devotion to the Immaculate Heart means nothing more than each person doing God’s will and thus acquiring an “immaculate heart” of his or her own, thereby reducing the one unique Immaculate Heart of Mary, the Mother of God, to a general condition any person can attain. The conversion of Russia to Catholicism and the spreading of devotion to the one, unique Immaculate Heart of Mary throughout the world are not even mentioned in Cardinal Ratzinger’s commentary. Further, the only Fatima “authority” the Cardinal cites is Father Edouard Dhanis, S.J., a modernist Jesuit who spent years casting doubt on the prophetic elements of the Message of Fatima concerning Russia. Father Dhanis claimed that these elements of the Message were pious inventions of Sister Lucy. Dhanis refused to study the official Fatima archives or consult other documents made available to him, so that he would not have to withdraw his false thesis. In keeping with Father Dhanis errors, which reduce Fatima to generic piety with no prophecy or warning of future events, Cardinal Ratzinger’s commentary concludes its assault on Fatima by asserting that all that remains of the Message of Fatima are prayer and penance. The Message of Fatima commentary, while appearing to support Fatima, is actually an attempt to remove the prophetic elements from the Message (including the spread of Russia’s errors, Russias Consecration and conversion to Catholicism, and the spreading of devotion to the Immaculate Heart of Mary) and bury them. It is an attempt to reduce the profound meaning and implications of these elements, so that they will be ignored and then completely forgotten. On November 17, 2001 Archbishop Tarcisio Bertone conducted an interview with Sister Lucy at her convent in Coimbra, Portugal. One month later L’Osservatore Romano published Bertones communiqué about the interview.1 The communiqué claimed that Sister Lucy agrees with Cardinal Ratzingers commentary from the Message of Fatima, including that much of the Fatima Message was invented by her. Then, according to Msgr. Bertone, Sister Lucy says that the 1984 consecration of the world sufficed for a consecration of Russia, and that “everything has been published; there are no more secrets.” The first part of this statement contradicts everything Sister Lucy has said publicly to the contrary for the better part of seventy years. The latter part of the statement is presented as Sister Lucys answer to a question about the Third Secret — but the question, oddly enough, is not provided. The Bertone communiqué demonstrates that Sister Lucy is still being treated as if she were a member of the federal Witness Protection Program. Yes, of course, she is a cloistered nun. But an interview is an interview, and two hours of talk is two hours of talk. In two hours about 11,000 to 14,000 words are spoken. Yet we were given only 463 words from Sister Lucy. Where is the interview, and what happened to the two-hour conversation? And how can we square this curious substitute for a real interview with the claim that Sister Lucy has told us everything there is to know about the Message of Fatima? If she has told us all she knows, then there is nothing to hide. And if there is nothing to hide, why not publish everything she was asked and all that she answered during those two hours? Indeed, why not simply allow Sister Lucy to speak to the world herself for as long as she wishes, and lay all the questions to rest? The final three months of 2003 saw a new development manifest itself at Portugals Fatima Shrine that provoked outrage from Catholics worldwide. The series of events started with an interreligious Congress held at Fatima, wherein allegedly Catholic speakers denounced and undermined defined Catholic dogma. This was followed by reports that the new $45,000,000 modernistic basilica being built at Fatima would become an interfaith Shrine. Fatima officials denied that Fatima would become an “interfaith temple”, yet simultaneously affirmed the new interfaith orientation at Fatima. Then on May 5, 2004, Fatima Shrine Rector Guerra allowed a group of Hindus to conduct a public prayer ceremony at the Catholic altar, an act forbidden by the entire history of Catholic teaching and practice. Despite worldwide protest, Fatima Shrine Rector Guerra defended the Hindus prayer ceremony at Fatima, while the local Fatima newspaper, Notícias de Fátima, demeaned and insulted faithful Catholics who protested the interfaith outrage. On October 10-12, 2003 Fatima Shrine Rector Guerra hosted the interreligious Congress at Fatima: “The Present of Man, the Future of God, the Place of Sanctuary in Relation to the Sacred”. The Congress was attended by journalist John Vennari, whose reports were published in The Fatima Crusader and Catholic Family News. Vennari said the Congress “contained some of the most explicit heresy I have ever encountered”. Vennari also audio-taped the entire congress and video-taped portions of it. Here is a sampling of what took place. Speakers at the Congress, including Father Jacques Dupuis and Archbishop Michael Fitzgerald, told delegates that Catholics should not seek to convert non-Catholics to the Catholic Church. This is because, according to the new ecumenical system, non-Catholics are already part of the “Reign of God,” and do not have to convert to the Catholic Church for salvation. Those in the audience, including the Cardinal Patriarch of Lisbon, the Fatima Shrine Rector, the Bishop of Leiria-Fatima, and the Apostolic Delegate of Portugal all applauded Dupuis’ speech wherein, among many other outrages, he denounced a defined doctrine of the Church. The next day, the Vatican’s Archbishop Michael Fitzgerald told the audience, “Father Dupuis yesterday explained the theological basis of the establishment of relations with people of other religions.” In short, Archbishop Fitzgerald praised Father Dupuis’ heresy. This is a brazen denunciation of infallible, perennial Catholic truth. The Council of Florence, which Father Dupuis calls a “horrible text”, defined infallibly that “Pagans, Jews, heretics and schismatics” are “outside the Catholic Church,” and as such, “can never be partakers of eternal life,” unless “before death” they are joined to the one true Church of Jesus Christ, the Catholic Church. The Catechism of the Council of Trent, faithful to this truth, teaches, “infidels, heretics, schismatics and excommunicated persons” are “excluded from the Church’s pale”. In other words, Protestants, Jews, Mohammedans, Hindus, Buddhists, etc., are not part of the Catholic Church, which is the Kingdom of God on earth. Yet Father Dupuis statements, as well as the entire orientation of this Congress, not only deny this defined dogma, but also promote religious indifferentism  the false belief that man may find salvation in any religion. This teaching was explicitly condemned by the consistent teaching of the Catholic Church from the very beginning, and was especially condemned by Popes Leo XII, Pius VIII, Gregory XVI and Blessed Pius IX. Yet these “wicked opinions” and “deplorable errors” were promoted at the 2003 pan-religious Congress sponsored by Fatima Shrine Rector Guerra. The Sunday session at the Congress included testimonies from representatives of Buddhism, Hinduism, Islam, Anglicanism, Eastern Orthodoxy and Catholicism. At this session, Father Arul Irudayam, Rector of the Catholic Marian Shrine at Vailankanni, India, boasted that, as a further development of ecumenical camaraderie, Hindus now perform their heathen rites inside the Catholic sanctuary at the Shrine. As it turned out, Fatima Shrine Rector Guerra would host a similar desecration of the Fatima Shrine only seven months after the interreligious Congress. Two Portuguese newspapers, the Portugal News and Notícias de Fátima (the local newspaper of Fatima on friendly terms with the Fatima Shrine) featured the statement, “The future of Fatima must pass through the creation of a shrine where different religions can mingle.” Notícias de Fátima printed these words as a front page photo caption, and the Portugal News attributed these words to the Fatima Shrine Rector, Father Guerra. 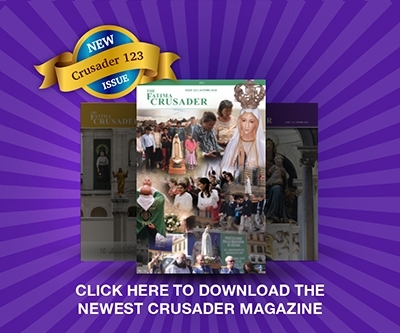 The Fatima Centers published reports of the Fatima Congress, widely disseminated in print and over the Internet, sparked worldwide outrage by concerned Catholics against the new pan-religious orientation at Fatima. Following several weeks of growing protest and controversy on the web and elsewhere, Archbishop Michael Fitzgerald, the head of the Vaticans Pontifical Council for Interreligious Dialogue, was asked by the British Catholic journal The Universe to comment about the plan. In his brief response, the Archbishop said that “there was no question of the Fatima sanctuary becoming an interfaith pilgrimage center,” but notably left open the issue of whether the shrine would continue to promote radical ecumenical activities discussed at the recent congress (of which he was a prominent attendee). Likewise, journalist John Vennari noted that arguments and discussions over the label “interfaith Shrine” are now merely a distraction, since “Fatima is already a place of interfaith activity, whether it is officially called an interfaith Shrine or not”. In fact, Rector Guerras Communiqué only confirmed the new interreligious orientation at Fatima. Rector Guerra also made the absurd claim that Our Ladys Message of Fatima was a call to interreligious dialogue. This is ludicrous, as the interreligious dialogue and practice now going on at Fatima would have been immediately condemned by Pope Benedict XV, the reigning Pope at the time of the 1917 Fatima apparitions. Guerra deals in an ambiguous manner with the charge of opening up Fatima to non-Catholic religions. He says, “We are not open to share the way we worship, at least in what pertains to the sacraments, specifically the Eucharist. … Therefore, the worship space which, God willing, will soon start to be built … will be marked exclusively for Catholic worship.” He then said, “when it seems to us to be opportune … this basilica would be able to receive brothers from other faiths who may want … to see how we pray” (all §4, emphasis added). A few weeks later, when the editor of a Marian website asked Rector Guerra about allowing non-Catholic religions to worship at the Shrine of Fatima, Guerra responded, “We are still very far from having Hindus or Muslims pray at Fatima …” He did not say that it would never happen. He left the door open. It was clear that pagan worship at Fatima was only a matter of time. The denials and equivocations of Archbishop Fitzgerald and Rector Guerra all proved to be hollow. For on May 5, 2004, a Hindu ceremony was held in Fatimas Capelinha, a chapel built on the very ground where Our Lady appeared in 1917. The event was broadcast on May 5 by SIC, an independent television station in Portugal, who called the event an “uncommon ecumenical experience”. The broadcast showed that a group of Hindus, after worshipping their various gods at the Hindu temple in Lisbon, traveled by bus to Fatima. Upon their arrival, they were permitted to use the Capelinha for a prayer ceremony. Three Hindu girls went into the sanctuary and placed flowers at the statue of Our Lady, and a Hindu “priest”, in a traditional Hindu vestment, stood at the Catholic altar and chanted the “Shanti Pa”, a prayer for peace. The Hindu congregation then responded with religious chant. All of this was done with the blessing of Rector Guerra, who appeared on the SIC television broadcast stating that he welcomed the Hindu visit. Afterwards, said SIC, “the Hindu pilgrims are received as if they were an embassy; an unheard of gesture, which can be understood as an invitation for other visits.” Here, Bishop Serafim of Fatima and Rector Guerra were thanked and willingly accepted on their shoulders shawls, from the hands of the Hindu “priest,” which were covered with verses of the Bhagavad Gita, one of Hinduisms holy books. Two days later, on May 7, Notícias de Fátima, the local newspaper of Fatima, castigated those who oppose the new interfaith orientation. Along with quotes from Rector Guerra, the newspaper quoted a certain Brother Valente who denounced those who resist ecumenism as people who have “missed the train”, and compared these faithful Catholics with the “Taliban”. The Hindus went to Fatima, they said, to offer praise to the “Most Holy Mother”. Let us keep in mind that what the Hindus mean by “Most Holy Mother” is different from what Catholics mean by that term. By “Most Holy Mother,” Catholics mean the Blessed Virgin Mary, the Mother of Jesus Christ, daughter of Joachim and Anna, a human creature. What the Hindus mean by “Most Holy Mother” is a manifestation of one or more of their gods or goddesses. The Hindus at Fatima offered Our Lady what they call puja, that is, divine worship. As the pilgrims and their shastri, or “priest,” explained, they regard Mary as the manifestation of God, just as they regard the deities of their own pantheon, each of whom has a male and female aspect. Mary they regard as the female aspect of the Christian deity, and the Christian deity as merely the Western conception of their maja deva, or supreme god. It is essential to understand this. The Hindus do not regard the Blessed Mother as an historical person distinct from Her Creator, but as one of their quasi-mythological avatars, or divine manifestations. Thus, the Hindus did not come to Fatima to engage in Catholic prayer. The Hindus were not Catholicized, rather the Catholic Shrine at Fatima was Hindu-ized. They used the Shrine at the very place where Our Lady appeared to the little shepherds, to perform rituals to pagan gods, whom St. Paul calls “devils” (1 Cor. 10:20). In short, Rector Guerra allowed pagan worship at the Catholic altar at Fatima. Worse yet, he later defended the outrage in a June 29 Communiqué, wherein he employed dishonest terminology and fallacious arguments. Rector Guerra, in this Communiqué, explained that he has welcomed other non-Catholic and non-Christian dignitaries who have been “welcomed” at the Shrine in the past, such as the Dalai Lama, Hillary Clinton and the wife of Yassar Arafat. Yet this has no bearing on the May 5 Hindu ceremony, as none of these visiting dignitaries attempted to conduct public pagan worship services at the Catholic altar. Rector Guerra denied that anyone was in the sanctuary of the Capelinha except the Hindu “priest” and his translator. Once again, this denial is proven false by the SIC broadcast that shows three young Hindu women entering the sanctuary to place flowers at the statue of Our Lady. Guerra also said that “no gesture was made, nor rite was performed, on or off the altar”. This is not true. The SIC broadcast clearly shows the priest chanting the Shanti Pa at the altar, and the Hindus in the congregation chanted the response. This is a Hindu religious ceremony that took place at a Catholic altar. Published photos on this web site from the SIC television broadcast confirm this fact (see “Pictures of a Desecration: Photo Report of Hindu Ritual at Fatima“). Sadly, in his denials, Rector Guerra is not telling the truth. Further, Rector Guerra tries to justify the Hindu visit, claiming that the Hindus came to worship the “Most Holy Mother”. It is obvious in the Communiqué, however, that Rector Guerra knows full well the difference between Our Blessed Lady and the Hindu “Holy Mother”, since Rector Guerra always uses the term in quotes, and never refers to the Hindus coming to honor “the Blessed Virgin Mary, Mother of God”. This is deliberate dishonesty. It is a betrayal of Father Guerras duty as a Catholic priest to teach the truth. It is a blasphemy against Our Lady. Father Guerra apparently regards the Hindus remark that Mary is the Holy Mother to be evidence that the devotions of the Hindu at Fatima are acceptable to God rather than sacrilegious. Since it is well known that Hindus regard the Holy Mother to be 1) a goddess, 2) manifested through various forms, including 3) the blood-drenched nightmare Kali and the cosmic prostitute Armani, then it would appear that Father Guerra has more explaining to do. Equating Father Guerras earthly mother with a murderous psychopath and a prostitute would surely be unacceptable to him; why then does he casually accept the parallel analogy regarding his heavenly Mother Mary, the Mother of Our Lord? In late 2003, Rector Guerra had assured Catholics that there would be no sacrilegious worship under his watch at the Fatima Shrine. Many, including EWTN and Father Robert J. Fox, took Rector Guerra at his word, and argued that sacrilege would certainly not be welcomed at Fatima. After the Hindu ritual took place, Rector Guerras advocates could no longer hide behind his so-called “denial”. The evidence was clear for all to see. Despite this, EWTN and Father Robert J. Fox continue to defend Rector Guerras actions, and continue to attack faithful Catholics who protest the outrage. This can only mean that Father Fox and EWTN approve of Hindus worshiping their false gods at a Catholic altar. Meanwhile, the Fatima Center continues to protest the present outrages at Fatima, it urges its readers to offer prayers of reparation, and it continues to provide updates on these tragic, heart-wrenching, sacrilegious developments. The Italian version was published December 21, 2001; the English version in the L’Osservatore Romano English edition published on January 9, 2002. It is also important to mention that Sister Lucy’s recent book, Calls of Heaven, was purported to have “answer[ed] all the questions on Fatima.” Yet the two topics that require the most explanation and which need to be answered, the Consecration of Russia and the Third Secret, were not mentioned.